Did the baby Jesus know the quadratic formula? Many among conservative evangelical churches might respond to the question with a quick, emphatic “yes.” After all, Jesus is God, and God knows everything, math included. However, the answer to the question is more complex than this. To give the “yes” answer with only Jesus’ divinity in view does not take into consideration his humanity. The Scriptures tell us that Jesus grew in wisdom (Luke 2:40, 52), that he learned obedience (Heb 5:8), so Christians must come to terms with every- thing the Bible teaches about Jesus, about both his deity and his humanity. 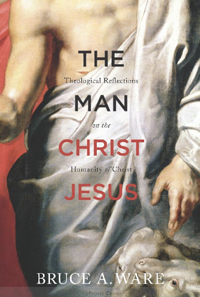 Thankfully, works like Southern Seminary theology professor Bruce A. Ware’s The Man Christ Jesus confronts us with the reality and implications of Christ’s humanity. Until believers reflect on this truth, they will not appreciate the extent to which the eternal Son humbled him- self in becoming a man. In this 160-page treatise, Ware discusses the significance of God the Son taking on a human nature in addition to his eternal pre-existent divine nature as the second member of the Trinity. He dedicates chapter-length treatments to matters related to the exercise and expression of Jesus’ divine attributes in light of the incarnation, what it means for him to conduct his ministry and miracles by the power of the Holy Spirit, the significance of his resisting temptation as a man and the necessity of his coming as the God-man in order to die in humanity’s place, among other discussions. Christ’s humanity is not some complex abstract notion meant only for theologians to contemplate. Ware demonstrates this by including points of application to end each chapter along with a list of discussion questions aimed not only to stimulate careful thinking, but to help readers see how Jesus’ life as a man bears upon their lives.